Another client of THGM Writing Services publishes his book: He Will Guide You: Truth, Experience The Holy Spirit, by Rev. Dr. John Diomede. John set out to write a very specific book. He wanted to help Christians make sound decisions by enhancing their relationship with the Holy Spirit. The resulting book is all about you and the Holy Spirit. John sees something missing in the church today. Jesus said He would send the Holy Spirit to be with believers. He said this would be the “norm” for His relationship with them. That relationship with the Holy Spirit is what the Reverend Diomedes hopes to rekindle in Christian readers. The Holy Spirit is waiting to guide believers into all truth. But do you know how to listen for and hear His voice despite the clamor of secular daily life? Do you understand what He is saying? By opening your spirit to receive the Holy Spirit, you will know the truth, and the truth will set you free. Learn how to overcome aloneness by experiencing a deep and fulfilling relationship with the Holy Spirit, our spiritual connection to the Almighty. He will guide your journey through the wilderness of life as you conquer uncertainty and seek God’s counsel. Rev. Dr. Diomede, pharmacist and pastor, opens the floodgates in a thirsty land peopled by lonely souls longing to know their Savior and God. 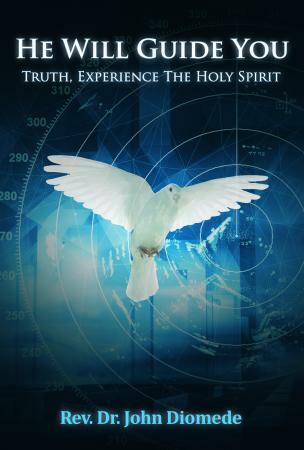 You can get your copy of He Will Guide You: Truth, Experience The Holy Spirit at Xulon Press.